You cannot talk about Azeri cuisine without talking about dolmas! But what exactly is dolma? Dolma (Ottoman Turkish طولمه) is a word that comes from the Turkish verb dolmak, which means “to be stuffed”. Dolma in Azeri. տոլմա (tolma) in Armenian. ტოლმა (tolma) in Georgian. ντολμάς (dolmas) or ντολμαδάκι (dolmadáki) in Greek. دلمه (dolmeh) in Persian. 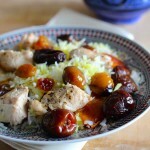 دولما (dolma) in Arabic. دۆلمە (dolme) in Kurdish. So many names to describe the same thing. 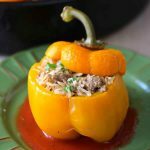 Dolma is a family of recipes of stuffed vegetable or leaves born in the kitchens of the former Ottoman Empire and its surrounding regions. Where can you find dolma? 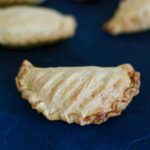 It is now emblematic of Greek and Turkish cuisines, and it can also be found in the Balkans, the Caucasus countries, the shores of the Eastern Mediterranean, the Near East, the Middle East , Central Asia, North Africa and Western Mediterranean. Dolma is widespread in Algeria, Armenia, Bulgaria, Cyprus, Georgia, Greece, Jordan, Lebanon, Uzbekistan, Romania, Syria, Egypt and Turkey. It can also be prepared with the leaves of wild mulberry. 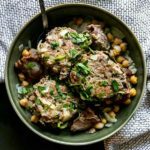 The dolma recipe is also prepared in Morocco, mostly in the north, specifically in the areas of Tetouan and Ksar El Kebir. In Israel, besides grape leaves, dolmas are also prepared with chard leaves, cabbage, artichoke bottoms, potatoes, eggplants, onions, dates, zucchinis, bell peppers, beets, but also figs and dried apricots. What are the different versions of dolmas in Azerbaijan? The best known dolma recipe is the dolma made from grape leaf, which is more precisely called yaprak dolma or yarpaq dolmasi in Azerbaijan. Stuffing can include meat or not. A meat dolma is usually served warm or hot, often with sauce; vegetarian dolmas are typically served cold. Both are often eaten with yogurt with garlic. In Azerbaijan, dolmas are not just stuffed grape leaves. To make dolmas, people also stuff zucchini, eggplant, tomato, or cabbage as in sarmas or artichokes as in dolma qarnoun . 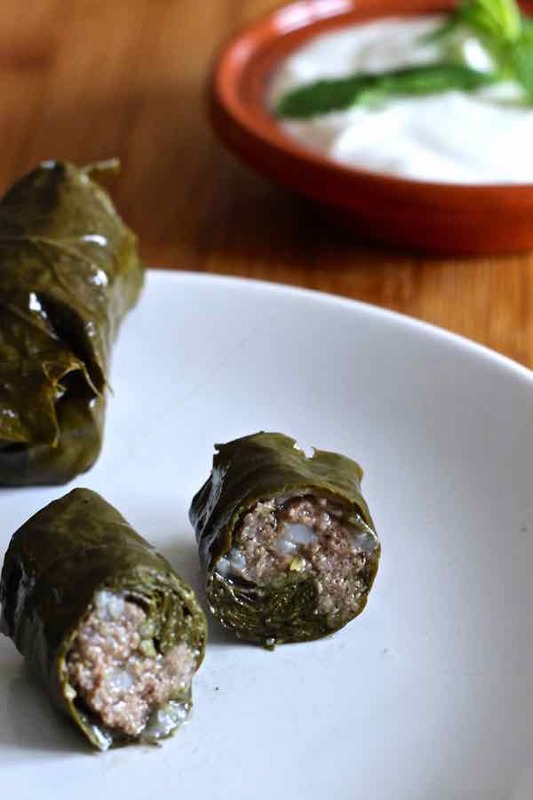 Dolmas are traditionally stuffed with ground lamb and/or beef, rice, onions, and herbs. There is no Azerbaijani table without dolmas. They are so popular that the Ministry of Culture and Tourism of Azerbaijan is currently busy building a case to present dolma to the Unesco as an Azeri culinary tradition that could make it to the World cultural intangible heritage. Abulfaz Karaev, Azerbaijan’s Minister of Culture and Tourism apparently takes this matter very seriously. We prepared these dolmas for a family dinner that was full of laughs. The dinner was held at Mony’s, Mike’s dad who kindly invited me. 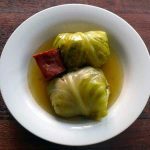 But Mike also had some of the leftovers for a poker night, much like the poker evening for which he prepared sarmas from Serbia, another variety of dolmas, this time wrapped in fermented cabbage leaves. It was the first time I used and even tasted grape leaves. Do not ask me why but until today, it never attracted my palate. I can now tell you that I love them! 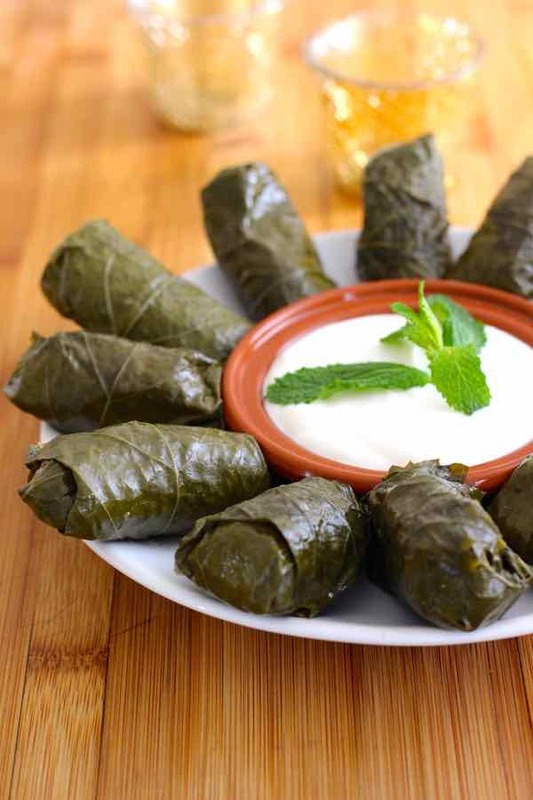 Dolma refers to a family of stuffed grape leaves or vegetables, widespread in the Middle East, Western Asia and Mediterranean regions. In a large bowl, mix the ground meat, onion, rice, fresh herbs, salt and pepper and knead vigorously for 5 minutes. 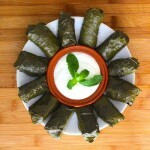 - If using fresh grape leaves, blanch 10 at a time in a large saucepan of boiling water for 2 minutes. This will soften the leaves and make them easier to roll. Remove the leaves with a slotted spoon. Cut the stems or hard veins. - If using canned leaves, place them in a large colander and rinse thoroughly with cold water. Cut stems or hard veins. If canned leaves are too thick, blanch in boiling water, in the same manner as fresh leaves, but only for one minute, then drain. Place the shiny side of the grape leaf down on a board or in the palm of your hand, and place 1 teaspoon of stuffing at the basis of the stem of the leaf. Fold the lower end of the sheet up, then fold its sides over the filling and roll. You can also use a dolma wrapper for a quicker and easier process. In a Dutch oven or non-stick pot, place the stuffed grape leaves, close to each other. You can make several layers if necessary. 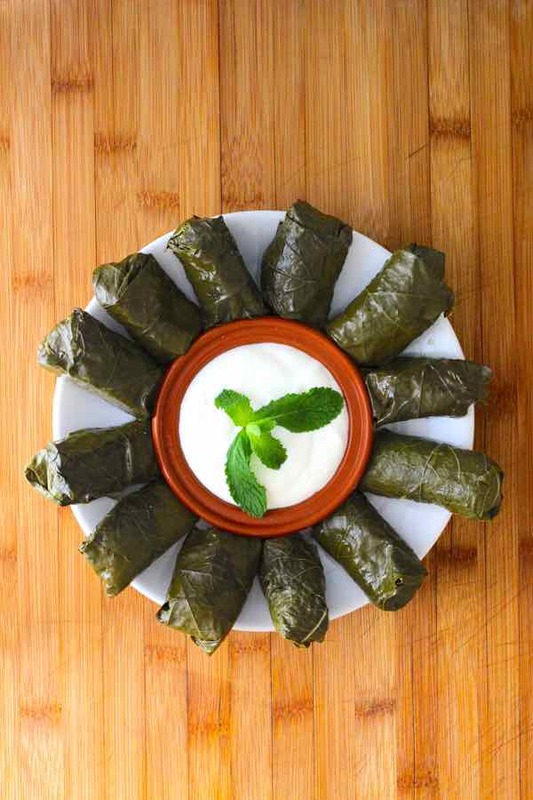 If using fresh grape leaves, sprinkle a little salt between each layer. Pour the melted butter over the grape leaves and add the water. 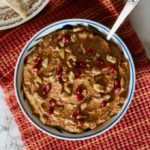 If necessary, place a small lid or a small plate on top of the dolmas to keep them tight and to prevent them from opening. Cover and bring to a boil. Reduce heat to medium/low heat and simmer for 1 hour 30 minutes to 2 hours or until the leaves are tender. Serve dolmas hot or warm accompanied by garlic yogurt. They were actually not as hard to make as I thought they would be. Thanks for the recipe! They came out so much better than when I buy them canned. It is a lot of work though!